Junior litigator Alek Moryc is forced to take on a unique case and prove that a murderer killed the victim because of a subliminal message secretly buried in the soundtrack of a violent film. After tense hearings and just as judgement is about to be handed down, disaster strikes and Alek is sucked into a frightening world of international terrorism. He discovers that the litigation case is one small part of an elaborate plan to create a global dystopia, and in result he becomes a threat to be eliminated. Now, Alek must struggle against impossible odds to save his family, his country, and himself. 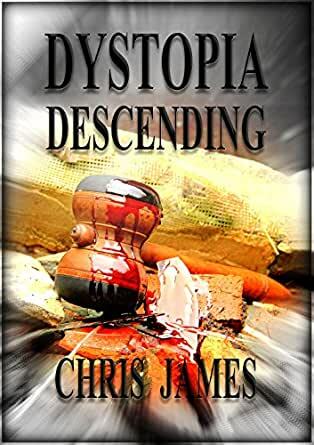 I've read just about everything Chris James has written, but I think Dystopia Descending is my favourite, so much so that I bought the Kindle version [for the fonts] despite already having the paperback version. So what made this story so special? A number of things actually. For starters, Alec Moryc is possibly the most rounded and sympathetic of James' male characters, and the tender scenes with his wife reveal him as the kind of person you'd like to know in the real world. And then there's the science. Imagine a world in which your deepest, darkest memories, and desires, can be dissected by a relatively simple 'scan'. Now imagine your employer using those scans to terminate your employment on the grounds that you /might/ have the tendency to embezzle the company? Actually the fear of this kind of abuse is all too real and harks back to the early days of DNA analysis when people feared that their genes could betray potentially debilitating diseases. I have no idea if the CCI scans in Dystopia Descending will ever become a reality, but Chris James makes it seem both plausible and inevitable. Now wrap the story in an unfamiliar locale - Warsaw - with little touches of a foreign culture [and cuisine]. Add corporate greed and double-dealing, political intrigue, social unrest [triggered by the CCI technology] and the possibility that Europe will once again be embroiled in a bitter war, and you have all the ingredients for a thrilling read. I would have given Dystopia Descending five stars but for the fact that I think the author's timing is a little off. If the technology does eventuate, I don't think it will happen any time this century. Sadly, the toxic politics of the book is an all too possible eventuality. A terrifying blend of courtroom drama, political thriller, and science fiction that describes an all-too-real path towards dystopia. I couldn’t put this fast moving novel down! The story begins with a detailed legal setting, an ominous new technology and a cast of characters who may all be quite different than they first appear. I was pleased the story was set in Europe as far too often, world politics focus only on North America. Full of action and intrigue, the author has woven compelling science and tech that has both societal and legal impact. I really had to pay attention to keep up with the varied elements of the story but I think that's half the fun of reading this book. I’ve read previous novels and stories by Chris James. I’m always impressed by his top notch writing and how he captures the personal, human consequences of alternate realities, while at the same time providing imaginative, well-researched science possibilities. Highly recommended.